The way we use to communicate with the world has completely changed in the last decade and the whole SAMP Group is ready to face this new challenge with a new digital strategy. Being in the platform that you use is a condicio sine qua non, but being there with relevant contents is our priority! We believe in sharing information and from now on, we will use and exploit to the fullest two main channels: websites and social networks! All of the new independent companies of the SAMP Group have their own new platform and they all share the corporate SAMP social networks. Therefore, stay tuned and start following us on LinkedIn, Facebook, Twitter , YouTube and Google+ ! Sampsistemi’s website has been totally revised in order to offer the best navigation experience to all kind of users. Our customers’ expectations are high and extremely different one from the other. For this reason, in order to satisfy all of you, we have developed four different navigations. You will not waste your time searching anymore! 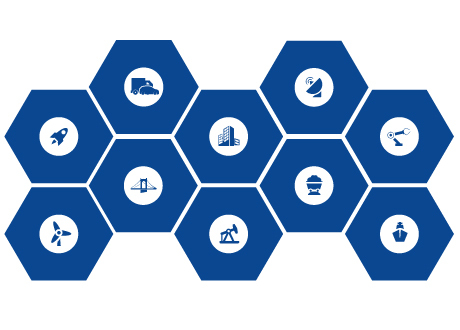 In our new site, you will be able to search by sector, application, product and through our special hexagons. Contents have been completely updated, the contact page re-designed, so it will be much easier to contact the right person and receive a prompt response from Sampsistemi. These are just a few examples of the changes we have made. To find out all of the others, start the navigation! In editing the website, special attention has been paid to the style, which looks fresh, young, simple but dynamic. We aimed at creating a useful, responsive and engaging outlook, and we believe that we have reached our goals!